The year 2007 marks the 85th anniversary of the signing of the Colorado River Compact. In November, 1922, delegates from the seven Colorado River Basin states met in New Mexico to discuss, negotiate and ultimately work out the compact. None other than Herbert Hoover, who become President Hoover in 1928 presided over the conference. Today, his name graces one of the two largest dams on the Colorado River. Over the objections of the Arizona delegate, the compact, dividing water rights between the upper and lower basins of the river was signed in Santa Fe, on November 24. 1922. Until this week, the compact was considered the defining document in Colorado River management. In 1922, the compact figured its allocations on hydrologic data from the Bureau of Reclamation that indicated annual Colorado River flow at Lees Ferry, Arizona to be 16.4 million acre feet per year (maf). In truth, however, Colorado River flow was a good deal less than that. Historical data from three centuries indicate an average flow of about 13.5 maf. Also, flows are highly erratic, ranging from 4.4 maf to over 22 maf. With our current eight-year drought, the 16.4 maf looks more like a hydrologist’s dream every year. 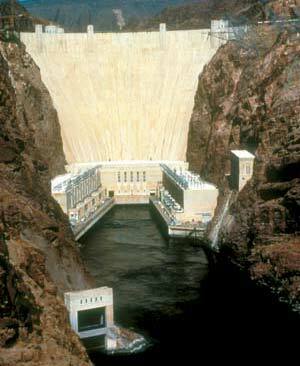 The December 2007 elevation of Lake Mead, behind Hoover Dam is 1112 feet above sea level. Just eight years ago, in 1999, the lake’s elevation was 1212, exactly 100 feet higher. Water levels in both Lake Powell and Lake Mead are at less than fifty percent of capacity. According to an article this week in the Los Angeles Times, “The federal government has ushered in a new era of shortage on the Colorado River, adopting a blueprint for how it will tighten the spigot on the West's most important water source”. In discussing the first signed Colorado River compact in 85 years, Interior Secretary Dirk Kempthorne said, "We have had good news and bad news. The bad news”, he said, “is that the drought shows ‘no sign of ending’”. The good news was that all seven states had agreed on how to share the ever-dwindling supply of Colorado River water. So, what does all of this mean to you? It really depends where you sit. If you sit anywhere in the Colorado River Basin, or in places like Phoenix, Arizona and Los Angeles, California, the legal concept that early water rights take precedence over more recent development helps protect you from a cut off of supply. Anthem, Arizona is one of those impossibly beautiful suburbs that developers have created in the Sonoran Desert, just twenty miles north (and uphill) from Phoenix. The architecture is contemporary, the lifestyle is idyllic and the vistas are grand. Because of its many amenities, in the early part of this decade, housing prices shot up like rockets in Anthem. The rockets fell to earth in 2007, when the real cost of water in Anthem hit home for its residents. As the build out of the town was completed, the deferred cost of water infrastructure was suddenly added directly to homeowners’ water bills, resulting in an initial 66% increase in water and sewer rates. The reasons that Anthem residents were hit so hard included several factors. First, as a new community, with no prior water rights or even an “uphill”, gravity-fed water source available, Del Webb, the developer of Anthem (now Pulte/Del Webb) took what they could get, which was water that had already been pumped uphill to Lake Pleasant, approximately ten miles away. Securing that water source was expensive, but made doubly so by the fact that Anthem, unlike Phoenix, was uphill from Lake Pleasant. Each time Anthem residents opens their taps, they are paying for initially high priced water, plus the energy cost of “double pumping” that water to their high desert paradise. Despite grumbling about the unfairness of it all, like gasoline, we all have to use water, so we simply pay the price. To carry the fuel and water analogy a bit further, what if the supply of either were curtailed or eliminated altogether? Although we do not like to contemplate such outcomes, we know that there is a finite amount of fossil fuel available on this planet. Despite being a “renewable resource”, water is renewed in the desert only if rain and snow fall on the high country, thus feeding the rivers and reservoirs from which we draw. According to that same LA Times article, “Scientists also predict that climate change will worsen Western drought patterns and reduce Colorado River flows by increasing evaporation and decreasing snowfall. One study released this year warned that global warming could thrust the Southwest into a state of permanent drought by 2050”. The lesson to be learned from all of this is to research before you buy property, what is its water source and how reliable and expensive will that supply likely become in light of the near-certainty of continued drought in the Southwest. Now I will let you in on a little secret. There is a place near Moab, Utah where the local water source is a deep valley aquifer, fed from the high mountain snows of the Sierra la Sal Range. With no other mountains between there and the Sierra Nevada, the La Sal Range scrapes the air clean of moisture, depositing it as snow, which feeds into the aquifer as the snow melts in spring and early summer. (Author's Note - April 17, 2014) All of the Pueblo Verde Ranchettes have now been sold. Located in the Spanish Valley, their water rights stem from that deep aquifer. Anthem, Arizona is “twice uphill” from its water source at Lake Pleasant. 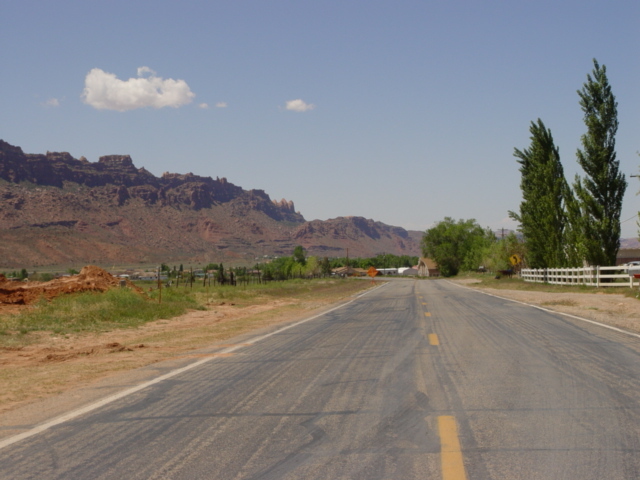 The Pueblo Verde Ranchettes, near Moab, Utah are uphill from the Colorado River and downhill from a reliable source of clean water.